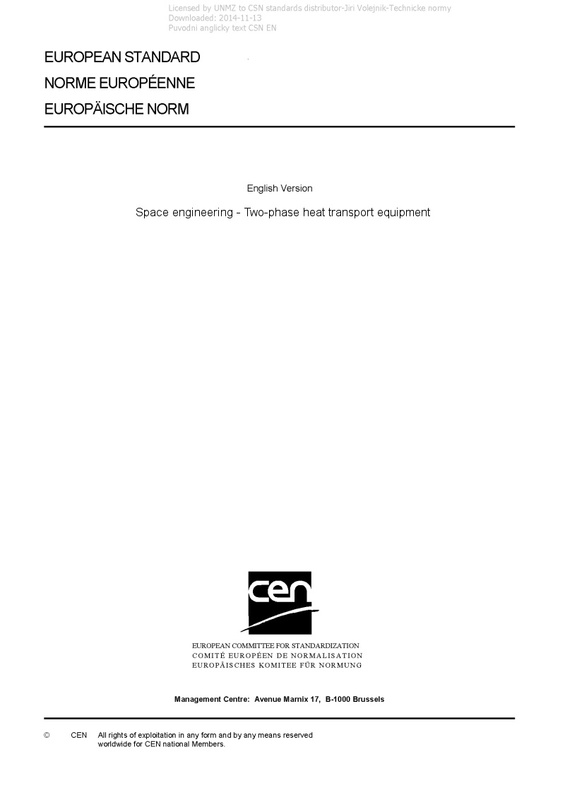 EN 16603-31-02 Space engineering - Two-phase heat transport equipment - This standard defines requirements for two-phase heat transportation equipment (TPHTE), for use in spacecraft thermal control. This standard is applicable to new hardware qualification activities. Requirements for mechanical pump driven loops (MPDL) are not included in the present version of this Standard. This standard includes definitions, requirements and DRDs from ECSS-E-ST-10-02, ECSS-E-ST-10-03, and ECSS-E-ST-10-06 applicable to TPHTE qualification. Therefore, these three standards are not applicable to the qualification of TPHTE. This standard also includes definitions and part of the requirements of ECSS-E-ST-32-02 applicable to TPHTE qualification. ECSS-E-ST-32-02 is therefore applicable to the qualification of TPHTE. This standard does not include requirements for acceptance of TPHTE. This standard may be tailored for the specific characteristic and constrains of a space project in conformance with ECSS-S-ST-00.